One week after release, the speedrun for The Legend of Zelda: Breath of the Wild has fallen under one hour thanks to a slew of optimizations and new techniques. Yesterday, speedrunner gymnast86 completed the game with a time of 58 minutes and one second. It is a significant time difference from the game’s first completed speedrun, a 3:39:39 by Orcastraw. Before the game was even released, runners were finding routes and running right towards the final battle with Ganon. Since then, a few major changes have altered the shape of the run. One of the smaller but crucial techniques is something called “whistle sprinting.” By holding the D-pad down and tapping the B button, it is possible to maintain a high ground speed while recovering stamina between sprints. It is a small movement technique that adds up to save significant time overall. One of the largest changes from initial runs comes after the players complete the tutorial area. 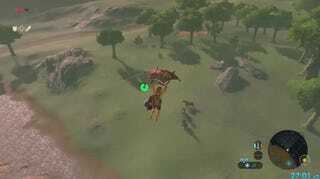 In order to reach Hyrule Castle faster, runners do not sprint all the way. They now pick up a horse. The method for acquiring a horse has generated a minor controversy, as it is possible to consistently and quickly acquire Link’s iconic steed Epona using the Smash Bros. Link amiibo. This is how current second place runner Orcastraw acquired a horse during their run. After the run was recorded, Redditors voiced considerable objection to the use of amiibos. “I feel like using amiibos is somewhat cheating. I’d rather see more creative, longer routes than magically getting better items right away,” one commenter said. Yet, for all of this contention from fans, runners just want to go faster by whatever means necessary. “To me, it seems silly to want to get rid of a cheap piece of plastic which makes runs of this game slightly faster,” gymnast86 said. He does not use an amiibo to acquire a horse during this world record run. Previous Zelda games had peripherals that aided their speedruns. The Wind Waker had a device called the Tingle Tuner, which could be used to purchase bombs and potions on the fly. It required a Game Boy Advance to use and was essential for certain glitches. Twilight Princess had amiibo functionality which gave items. A separate 100% category was established for that title for using amiibos. Update—7:05 p.m.: Since the time of publication, Orcastraw achieved a new sub one hour time slightly behind gymnast86 with a time of 58:06. You can watch the run below. It uses an amiibo. While amiibos might be contentious with viewers, runners stress that the larger time saves come from route changes and optimized boss fights. An altered path through Hyrule Castle now defeats a mini-boss to collect extra bomb arrows for the final fight. Instead of using the original, safer strategies for the final battles, runners now rely more on dodging and Link’s powerful ‘Flurry Rush’ counter attack as well as difficult guard parries that can send attacks back at the boss. “Since most people have beaten the game by now, there’s a lot more people finding strategies and watching runs, which helps,” Orcastraw said. These techniques help against a final boss that ranks among the series’ most difficult. “It is probably the most intense boss fight in any Zelda game I’ve ever done speedruns of,” gymnast86 notes. He says his largest time losses came from missteps in the boss fights. There’s also time to be saved depending on which language and version is being run. The WiiU digital version of the game has the fastest load times and the PAL region can use the German language. The latter affects voice acting and saves around twelve seconds from the English version that gymnast86 used for his run. “That was a bad run,” gymnast86 said after completing his world record. He explained that game is still in the early stages and that more changes will speed things up. “A game like this takes a while to get good,” he said. Still, for a game that’s taking casual players dozens and dozens of hours, a time under one hour is incredibly impressive. With a talented pool of runners and glitch hunters scouring the game for improved strategies, Link will soon be saving Hyrule within the blink of an eye.